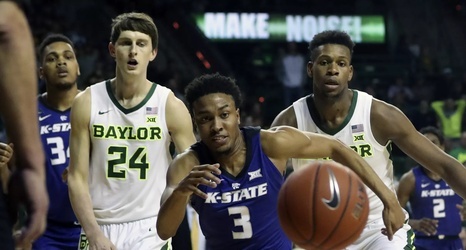 In a rugged game filled with runs and lead changes, Kansas State’s final run was enough to overcome the Baylor Bears, 70-63, Saturday in Waco. With the win, the Wildcats become the first Big 12 team to reach eight conference wins, and they open a one and one-half game lead on the rest of the Big 12 with eight league games left to play. K-State (18-5, 8-2 Big 12) rode a strong first half performance by Xavier Sneed and a strong second half from Cartier Diarra to weather a spirited effort by the Baylor Bears (15-8, 7-4).